Raised on a large farm in Iowa, James learned at an early age that a strong work ethic was an essential ingredient for any endeavor to be successful. “Do it right or not at all” was an advice from his father, which has served him well over the years. 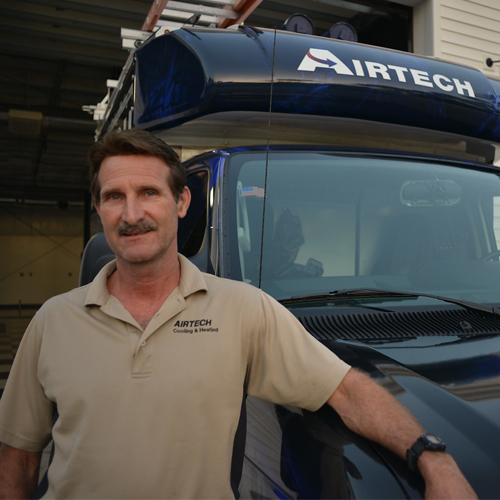 Quality products, workmanship, and attention to detail are all part of the philosophy at Airtech. No cutting corners here. When James isn’t running the show at Airtech, he often spends his time underwater, spearfishing in the Gulf of Mexico. Leisha keeps the office running smoothly at Airtech. Having helped James in the field in the early years, she possesses a significant amount of technical knowledge. Customers are surprised that she can help them troubleshoot over the phone. She is an excellent photographer and posts many of her photos on Facebook. Justin’s first ride along on a service call was at age two. Needless to say, he grew up around the A/C industry. After serving in the navy, working on the flight deck of an aircraft carrier, and attending a technical college, he returned to the HVAC field, bringing his drive and dedication to excellence to his customers. When not at work, he enjoys time on the water and going to the gym. Seth is a native Floridian and a graduate of Sarasota’s Suncoast Technical College’s air conditioning program. Seth always has that a smile, even if he is going into a hot attic to install ductwork. His goal is to give every customer their money’s worth. During his time off, Seth can be found in remote, muddy areas on various types of four-wheeled vehicles. That is why Airtech Cooling and Heating is here to help you. Established in 1991, our company has been providing professional services to our clients. We have more than 30 years of experience in the industry. Regardless of the complexity of the project, our team can immediately identify and address any heating and cooling system problems. Additionally, we are an American Standard dealer and a state-certified air conditioning contractor. Our team knows each of the product specifications of the units we install. You can count on us to help you get the most suitable heating and cooling system for your property. We take pride in our superior workmanship on installation jobs, honest approach, and accurate service. If you want a team that can provide you with high-quality work and customized solutions, work with us. We are located in Sarasota, FL, and we are available for appointments from 8:00 AM to 5:00 PM.